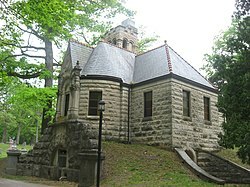 Lindenwood Cemetery is a cemetery operated by Dignity Memorial in Fort Wayne, Indiana, established in 1859. With over 69,000 graves and covering 175 acres (0.71 km2), it is one of the largest cemeteries in Indiana. Isaac De Groff Nelson helped to incorporate Lindenwood Cemetery, where a monument was built to him. Lindenwood was placed on the National Register of Historic Places on February 17, 1978. ^ "History - Lindenwood Cemetery". Dignity Memorial. Retrieved August 24, 2013. ^ "Lindenwood Cemetery" (PDF). National Register of Historic Places. National Park Service. August 24, 2013. ^ Dunn, Jacob Piatt (1912). Memorial and Genealogical Record of Representative Citizens of Indiana. Indianapolis, IN: B.F. Bown & Company. pp. 438–444. Retrieved 15 April 2016. This article about a property in Indiana on the National Register of Historic Places is a stub. You can help Wikipedia by expanding it. This page was last edited on 7 August 2017, at 10:58 (UTC).